I joined the gym this week, which is exciting and a little unbelievable to anyone who knows me and my blobby ways. As part of the membership I'm required to have a (free) postural assessment by a chiropractor who's based part-time at the gym. They take a couple of photos, enter it into a computer and do an assessment. It comes up with... a number, which represents the severity of the problem. My main problem is that my head is too far forward, which means there is an enormous amount of pressure on my neck and shoulders. The woman doing it looked at the number and said something like, "Whoa, I've never seen one that high before" then told me that the amount of pressure on my neck is the equivalent of if it were supporting the weight of THREE heads. Wow. ("I am not an animal!!") This information will be incorporated into the training plan the gym instructor creates for me - appropriate stretches and targeting particular muscles and all that - but I'll need to see the chiropractor too, to assess how much of the problem is muscular and how much, if any, is skeletal. I imagine I'll be seeing the chiropractor quite often, actually. Hmmm... not cheap. As if that were not 'exciting' enough, today I took my car in to be serviced. I knew the rear brakes needed replacing. The mechanic has just rung me to tell me that the front brakes also need replacing, as does the timing belt. Total - $950. Perhaps my car realised I was spending money at the gym and it felt left out. Unfortunately all of this means I have to delay the purchase of a new lounge. Just when I'd found one I really like! 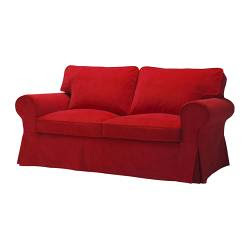 A pic is below - it's from Ikea, and I think I'll get a 2-seater plus a 2-seater sofa bed. But not for a while... still, perhaps I'll appreciate it more if I've had to wait and save up for it. i should have asked...which gym? Monash Aquatic and Recreation Centre, on Waverley Rd, Glen Waverley. I have a Fitness First pretty much at the end of my street but I've heard so many bad things about them I decided to go to MARC instead. Two friends from church go there and they've been very very happy with it.